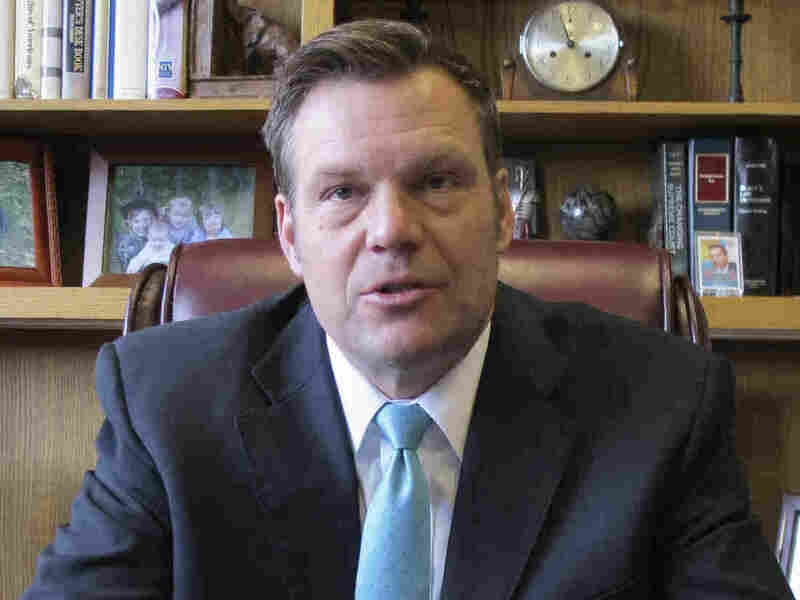 Federal Judge Holds Kansas Elections Official In Contempt Of Court : The Two-Way Kansas Secretary of State Kris Kobach was found to have violated a court injunction against providing new voters with confusing and misleading information about their registration. Kansas Secretary of State Kris Kobach is a Republican who had led President Trump's now-disbanded commission on voter fraud. The Kansas law, which went into effect in 2013, required people to show a citizenship document — a passport or birth certificate — in order to register to vote. In a lawsuit challenging the law, the American Civil Liberties Union argued that the law violated the National Voter Registration Act of 1993 and prevented more than 35,000 Kansans from voting. In May 2016, Robinson ordered Kobach to stop enforcing the controversial proof-of-citizenship requirement. The secretary of state appealed to the 10th Circuit Court of Appeals and lost. That panel called the Kansas law "a mass denial of a fundamental constitutional right." In March, Robinson heard a trial over the ACLU lawsuit in which Kobach represented the state. The judge has yet to issue a ruling in the case. With her contempt order, she instructed Kobach to pay attorneys fees to the American Civil Liberties Union. "Defendant has a history of non-compliance with the preliminary injunction order," wrote the judge in her 25-page contempt order. "The judge found that Kris Kobach disobeyed the court's orders by failing to provide registered voters with consistent information, that he willfully failed to ensure that county elections officials were properly trained," Dale Ho, director of the ACLU's Voting Rights Project, said in a statement. "Secretary Kobach likes to talk about the rule of law. Talk is cheap, and his actions speak louder than his words." A spokesman, Moriah Day, said in an email to NPR that Kobach will appeal.